The $10.000-added World Cup Bronze Trophy Non Pro final ended with a tie for first place between Gina-Maria Schumacher riding Gotta Nifty Gun (Dun It Gotta Gun x Custom Nifty Nic) and Austrian Tina-Künstner-Mantl riding Nu Chexomatic (Nu Chex To Cash x Tejons Little Lena), who posted a 223.5 each for their runs. The two decided against a runoff and became Co-Champions. Bernard and his stallion had had the second best score of the go round. And then the big show arena exploded with cheers when the two presented a brilliant performance in every manoeuvre. 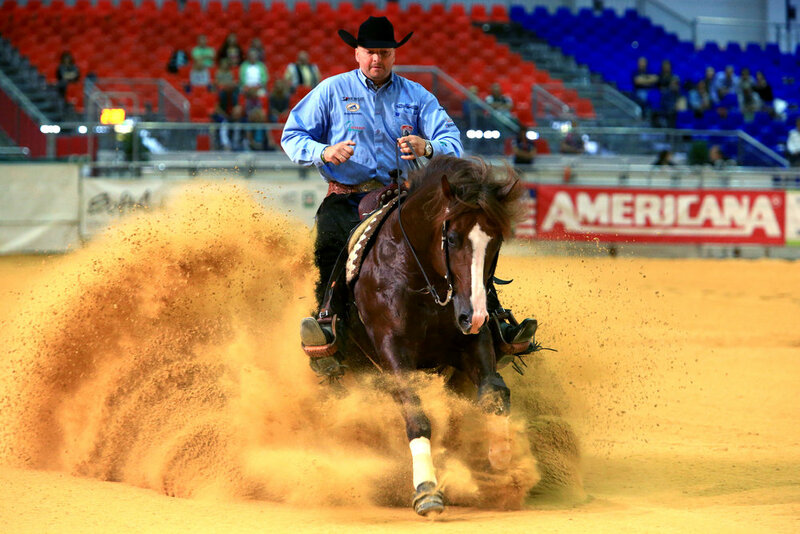 What a Wave melted into his last stop, backed up fluently – and left the arena with a 231! Grischa Ludwig and Nu Chexomatic placing second and Ann Fonck and Made in Walla placing third. ERCHA Reined Cow Horse Futurity Open Champion: Giovanni Campanaro & Bet Command Rey. In front of 5,000 visitors, Giovanni Campanaro claimed the ERCHA Reined Cow Horse Futurity Open Championship aboard Bet Command Rey (composite score: 864) and also became reserve Champion aboard WR Smoke Time (862). In fact, the 25-year-old Italian had four horses in the final and placed fourth aboard SJR Sumkinda Reydar and fifth aboard DG Little Rey Merada. The final of the World Cup Bronze Trophy Non Pro on Sunday should be a sight to see after this great go round! Ten riders in a field of 37 made it to the final, the minimum score being a 214.5. FEI World Champion Young Riders and NRHA World Champion Non Pro Gina-Maria Schumacher took the lead aboard her 7-year-old stallion Gotta Nifty Gun (Dun It Gotta Gun x Custom Nifty Nic) scoring a 221.5 with their fine, smooth run. The Intermediate Non Pro Bronze Trophy was run class in class with the Non Pro. Two riders tied on first place becoming Co-Champions: Lena Wolf aboard her Maganic (Magnum Chic Dream x Show Tennic) and Luke Phillimore aboard his 7-year-old mare Tin Whizin (Tinsel Nic x Whizin Off Sparks). Maria-Theresa Ottillinger and her 9-year-old gelding Magnum Brut (Magnum Chic Dream x Rosaline Chex) placed third scoring a 216. Damiano Avigni and Highbrow Time (High Brow CD x One Time Soon) had already dominated the World Cup NCHA Non Pro and they did even better in the final. The two posted a 152 with their remarkable run in a field of 12 finalists. This was the World Cup NCHA Non Pro Championship 2017.